Alright, this is a good trend we have here. Shortly after playing my first round of golf this year, Snake and I were able to arrange a second round. Imagine that, 2 rounds in one month. Must be a record of something. It's too bad that this round of golf would be at 1:00pm and right smack dab in our mini-heat wave in August. Of course, no meeting with anyone, regardless of activity is cause for eating. Thus, we met up prior to our round for lunch. At first we were planning on something good for hot weather, such as sushi. But as I was pulling up to Nao Sushi... it's closed on Mondays! Doh, epic fail. And of all things we could choose on a scorching day was Pho. 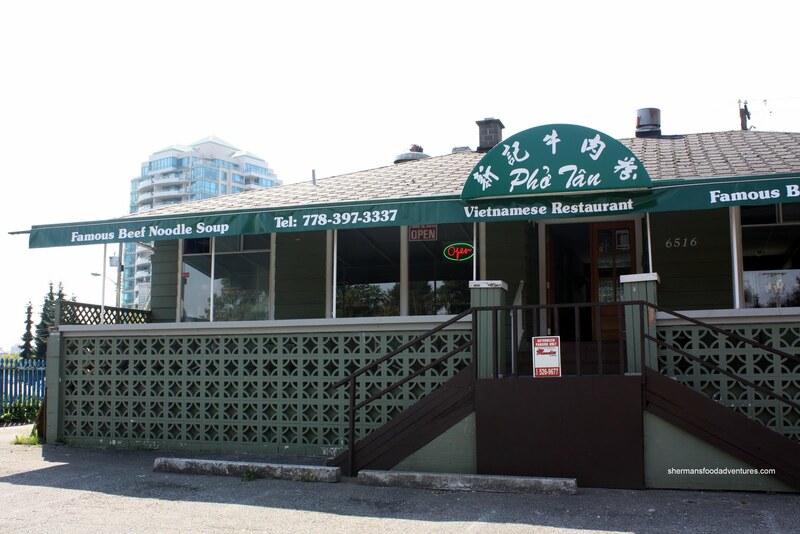 Located on the former Pho Saigon site, Pho Tan was our destination. Smart thinking Sherlock. Hot soup on a hot day, in a non-A/C room no less. What's with the lack of air-conditioned restaurants? And why do I end up at them on really hot days? Well, at the very least, we had a fan right beside us. 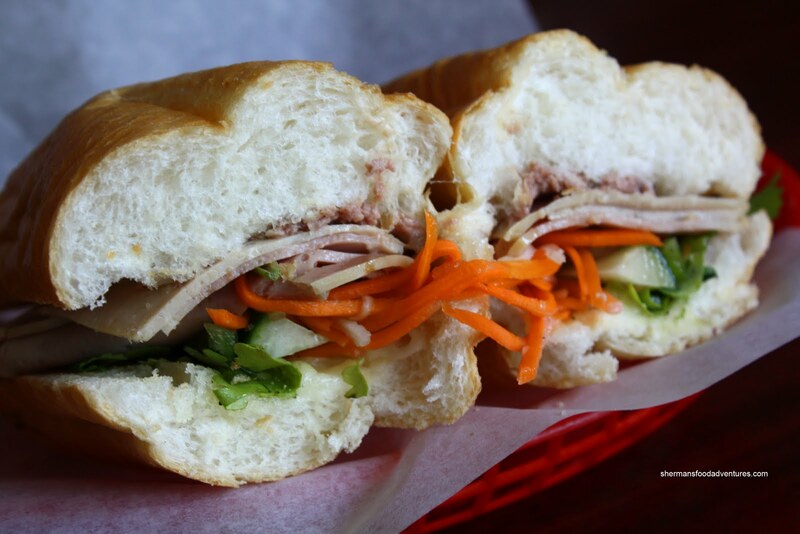 Too bad our menus kept flying off the table... And from that menu, we decided to share a Banh Mi. I gotta say, this is one of the most solid Vietnamese subs I've had in a restaurant. Sure, it was no Au Petite Cafe; but it was good. The bun was crunchy while giving way to an airy softness. Lots of flavourful pate and well-pickled veggies. Now for my hot Pho. I got the everything version and there was quite a lot of meat. The rare steak was surprisingly tender (most times it's chewy). I found the soup to be on the lighter side with the usual spices present; yet understated. The noodles were on the softer side; but not too much so. I liked how this was actually a large bowl of food, not only in name only. 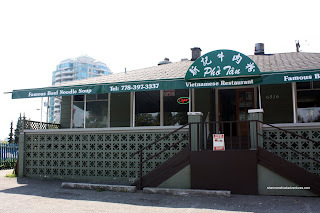 Snake, being the smart guy that he is, did not go for Pho. Rather, he asked the server which rice dish would be the best. She suggested the Lemongrass Chicken on Rice. When it arrived, it sure didn't look very big and although the chicken was very tender, it was bland. 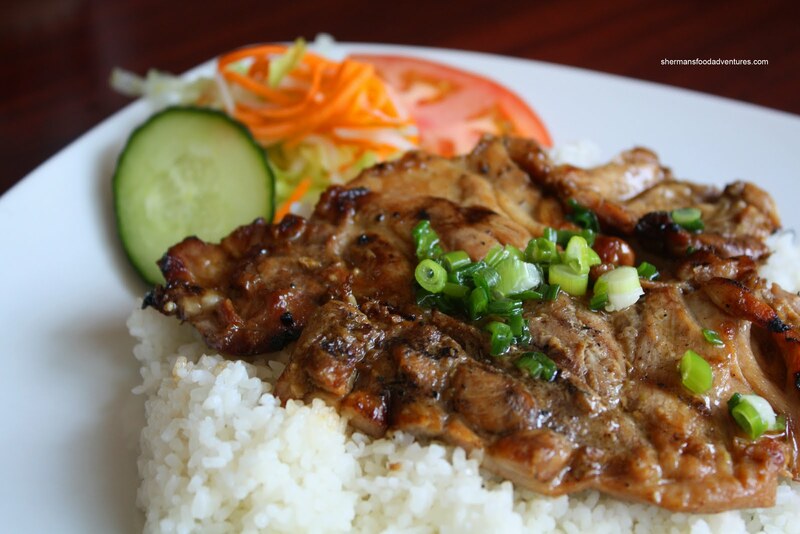 Not enough lemongrass or fish sauce. Not a good value or good flavour. 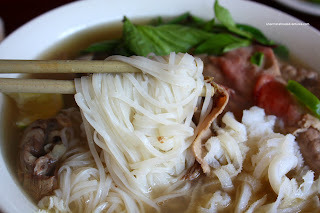 But based on the excellent Banh Mi and decent Pho, Pho Tan is worth checking out. The restaurant was clean and the service was friendly. Too bad there was not A/C though. But that would be my fault for doing hot soup on a hot day.